Working out of Venice beach, at least half of our staff bikes to work every day, riding down the shoreline or through the colorful neighborhoods. 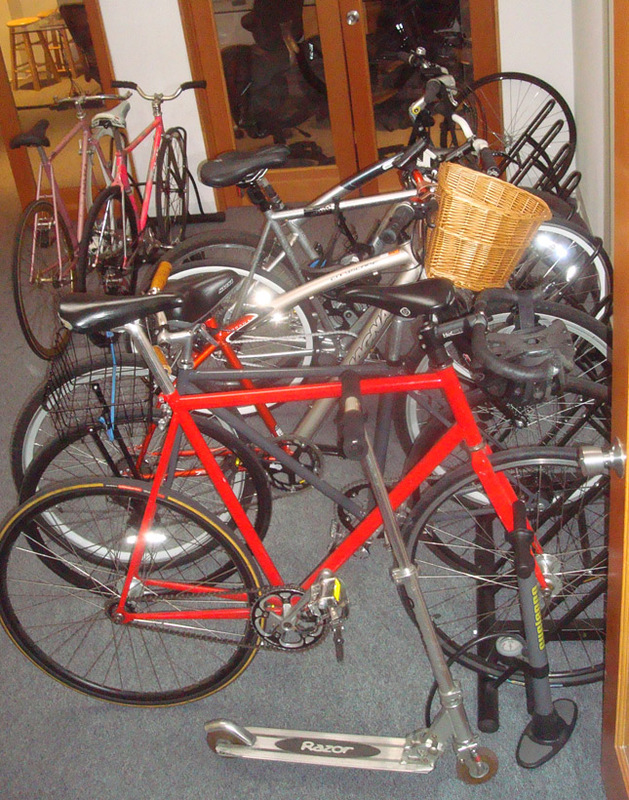 This has lead to a massive bike room, with six racks, spare tires, helmets and pumps strewn everywhere. And a scooter. Evan rides the scooter. Some of the bikes are really tricked out, we’ll do a spotlight on some of our bike enthusiasts and the sick tricks they can do as the summer heats up! This entry was written by paulhanges and posted on May 4, 2009 at 6:54 pm and filed under Uncategorized. Bookmark the permalink. Follow any comments here with the RSS feed for this post. Post a comment or leave a trackback: Trackback URL. Have you heard a song I can ride my bike with no handle bars?